Do you happen to know, offhand, how much REM sleep you get per night, or how much electricity your home’s water heater consumes while you are vacationing in St. Thomas? Have you calculated the fuel costs of making three trips to the grocery store each week instead of one? A number of Boston start-ups are developing and selling technology that makes it possible to monitor life’s minutiae, and to try to do better. Tapping into the American urge for self-improvement, and leveraging increasingly inexpensive sensors and wireless connectivity, some companies aim to make us healthier, others to save us money. Many enable you to share progress reports with friends via social networks such as Twitter and Facebook. But can monitoring and measurement go mainstream? Of the local start-ups, Zeo Inc. has probably attracted the most attention, with articles in The Wall Street Journal and a mention by morning show host Regis Philbin. 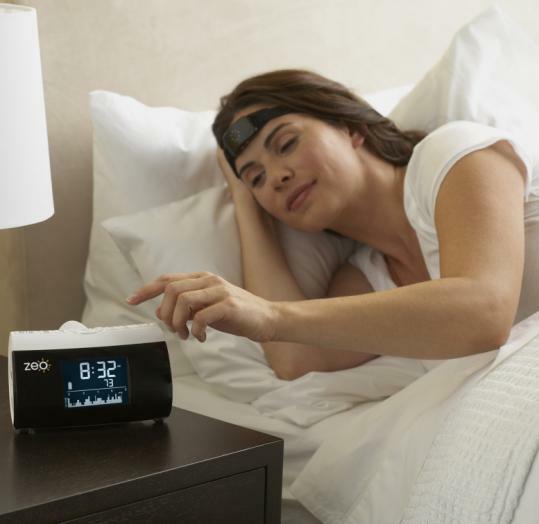 The Newton company sells a $200 “personal sleep coach’’ system, which consists of a bedside alarm clock that communicates wirelessly with a headband worn at night. The system tracks how long you sleep, and how long you spend in various phases of sleep. It calculates a “ZQ’’ score to capture the quality of your sleep, and can even wake you in the morning at the moment you are least likely to feel groggy. Last month, the company raised an additional $12 million in funding, some from the investment arms of Best Buy Co. and Johnson & Johnson. Ben Rubin, chief technology officer and co-founder of Zeo, says monitoring and tracking aren’t themselves activities that will appeal to typical consumers. “When you get beyond the early adopters, you need to show how you can help people lose weight or get more sleep, actually delivering a benefit that people want, beyond just tracking,’’ Rubin says. Though the Zeo system doesn’t do it automatically, some users post their ZQ scores on Twitter or Facebook, a sharing behavior that Rubin believes will help some personal measurement technologies spread further, faster. Jamaica Plain entrepreneur Benjamin Resner has built a prototype of a device that connects to a data port in your car. Every time you pull into your garage or driveway, the device links up with your home Wi-Fi network to send data about where you have been, how fast you have driven, and how much gas you used. One use is to calculate automatically how many work-related miles you have driven, for expense reports or tax deductions. But it could also be used to encourage teens to drive safely — no NASCAR-style starts when the light turns green — or enable anyone who drives, say, a 2010 Honda Civic Hybrid to see how their gas mileage compares to others with the same wheels. Resner’s start-up is called VroomGreen. To analyze your household’s power consumption, Newton-based Powerhouse Dynamics Inc. sells a device called the eMonitor, starting at $500. (Professional installation runs another $180.) It connects to your home’s electrical panel and enables you to better understand which appliances are causing your monthly bill to soar. Information presented on Powerhouse’s website lets you see a list of appliances in your home using the most power at that moment, for example. A similar company, launched by a trio of Boston College sophomores, aims to do something a bit simpler, at a lower price. Applied Power Innovations LLC is developing the “Power Dashboard,’’ aiming to sell it for about $200. Rather than looking at individual appliances, it monitors overall energy consumption in a home or dorm room, and instead of displaying use on the Web, shows it on a wall-mounted LCD display. A first objective for the company is getting universities to install dashboards in dorm rooms, perhaps to get students to compete to see who is best at saving energy. A Cambridge start-up called GreenGoose is developing inexpensive, general-purpose “stick on’’ sensors that can detect movement, sound, or temperature. (The sensors communicate with a compact base station that plugs into your PC. It’s green and shaped like a goose egg, of course.) A sensor could be affixed to a bicycle, toothbrush, or even a dog leash to keep track of how often they get used, and for how long. Activity data gets sent to a Web page that charts what happened and when. When you think about measurement devices that have become essential in every household, they are old (and commoditized) technologies like the scale or thermometer. But Rubin at Zeo points out that as the cost of heart-rate monitors dropped below $50, many amateur athletes and after-work exercisers adopted them. So lower prices will be key to reaching a mass market. A substantial marketing budget may be another: Among the most successful of the new wave of measurement devices is a sensor sold by Nike that slips into a special pocket in a sneaker and transmits workout data to a nearby iPhone or iPod.